As a long-term partner of MCCA's since 2008, Hub & Spoke has had the pleasure of helping the organization across multiple projects and mediums, including photography, website design, marketing strategy and branding. In early 2014, we helped launch a complete website overhaul, moving the organization from a dated system into an easily manageable, flexible website powered by Wordpress. As the organization expanded, administering multiple grants from the State of Missouri and federal government, our involvement increased, helping the organization create and manage a set of brand standards and marketing guidelines, along with creating portals for each of the workplace readiness grants. 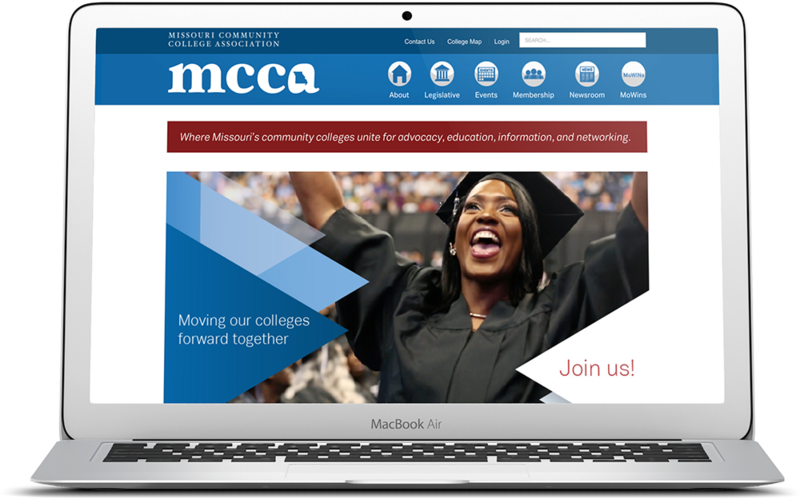 The Missouri Community College Association (MCCA) decided it was time to update their brand, including their logo and website. 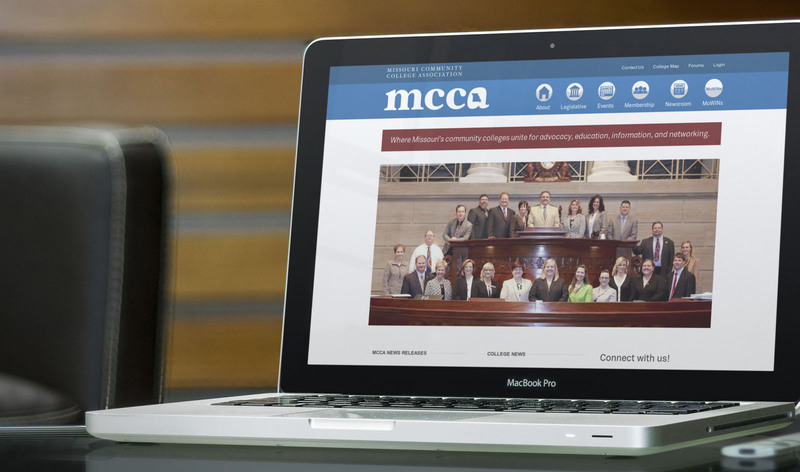 MCCA is an advocacy and lobbying organization for the community colleges throughout the state of Missouri. They felt their brand needed an overhaul to better reflect the accomplishments of Missouri Community colleges. It was also important that this new website was easy for the staff to update. Connecting Missouri Community Colleges with the public was the central focus of this project. In order to accomplish this, we did a full brand consultation with MCCA. This included market research which resulted in our recommendations on how to better connect MCCA’s brand with the public. To help MCCA stick to our plan, we created a comprehensive branding guide for them. Think of it as their roadmap to help them better connect with the communities they serve. We also decided to power their website with WordPress. This allows association staff to easily update the website as needed. Keeping the content fresh enables MCCA to be more relevant and continuously highlight the achievements of the community colleges throughout Missouri. At Hub & Spoke, we like to be more than just a web design firm, instead we're a complete marketing partner. 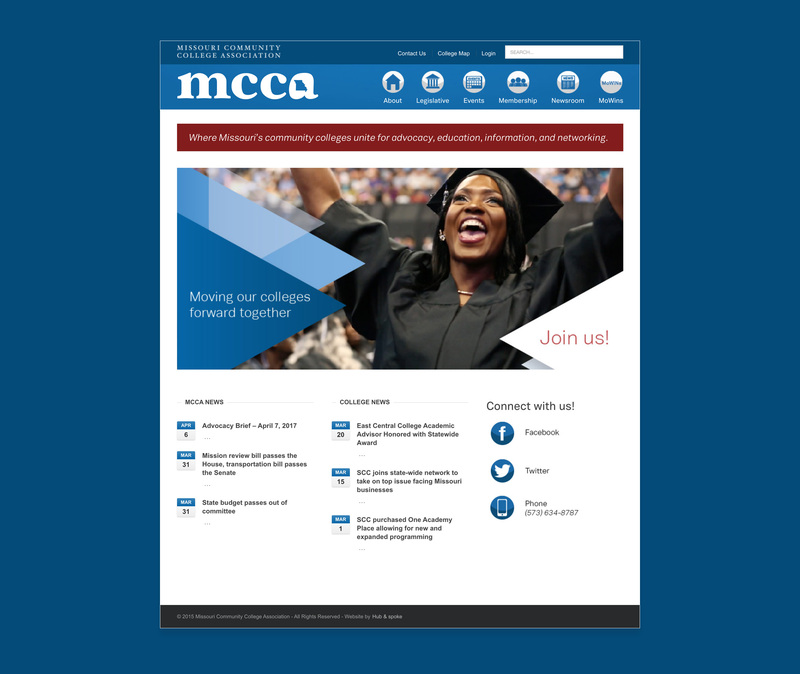 For MCCA, this meant helping them through multiple projects and disciplines, from website design to overall strategy to boost member engagement.